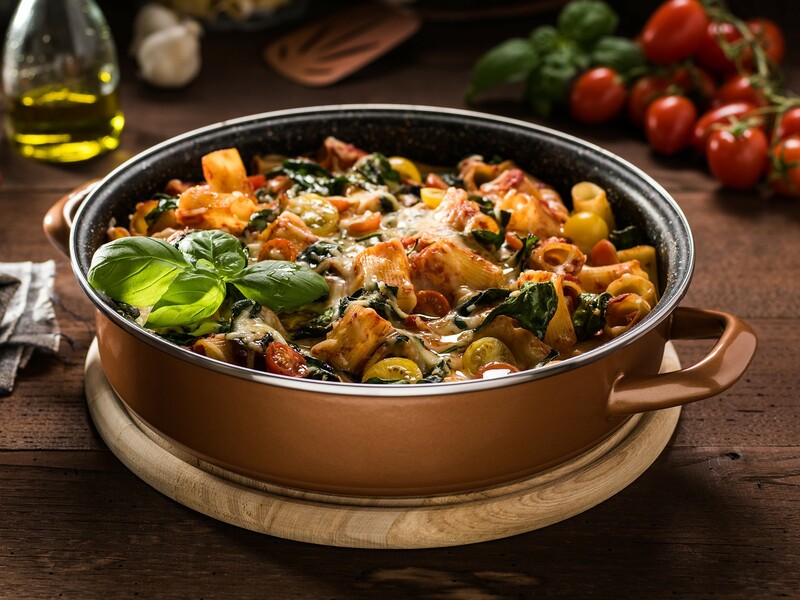 Stone Legend CopperLUX Round Mould is a new dish from the Delimano CoperLux collection. It comes with the newest non-sticking QuanTanium coating for healthier cooking with less oil and is suitable for all stoves, including induction and even the oven. Perfect for preparing delicious casseroles, steaks and roasts just as our grandmothers did. Choose from 2 sizes: 26 and 28 cm. 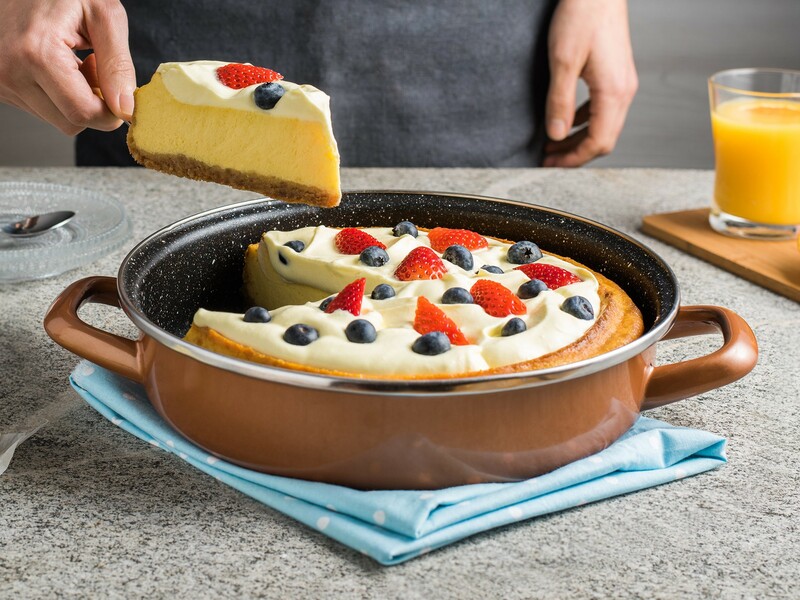 Create legendary meals with the incredible Delimano Stone Legend CopperLUX Round Mold. 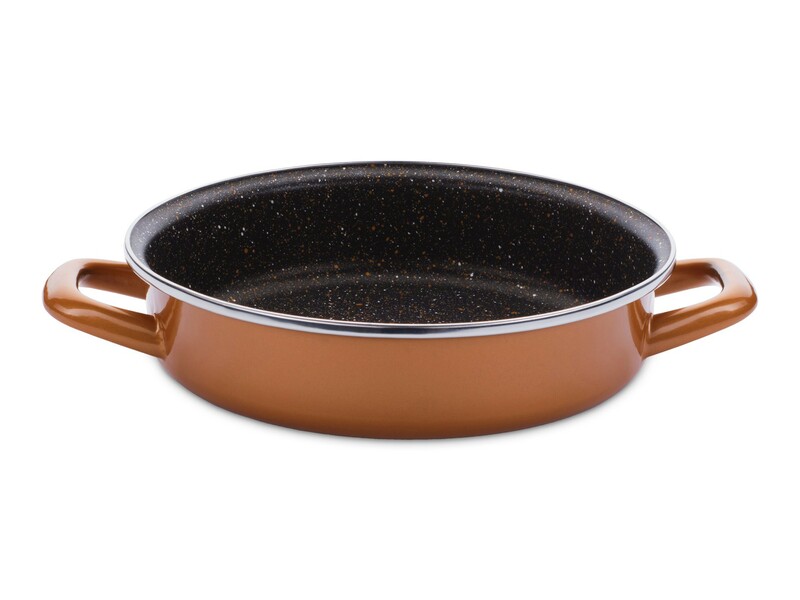 Stone and enamel, traditional cooking materials providing excellent heat distribution and properties to keep moisture, vitamins and aroma inside the cooked food are combined with non-sticking QuanTanium coating for healthier cooking with less oil. Stone Legend CopperLUX Round Mould can be used on any type of stove, including inductions. And you will love its versatility! Since it is suitable for both stove and oven, you can take this round mold from the stove and put it directly in the oven. 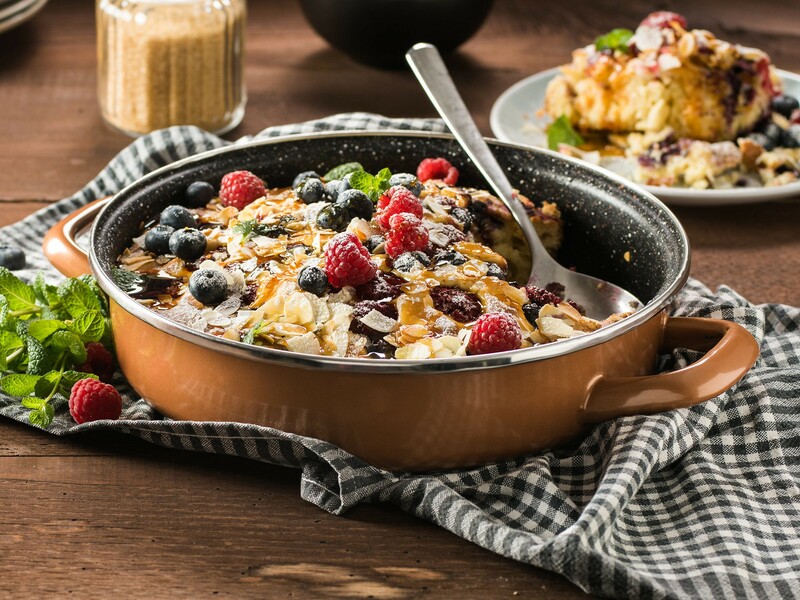 For absolutely delicious casseroles, steaks, roasts and even desserts! Choose from 2 sizes – 26 and 28 cm to fit your individual cooking needs. Preparation of low-fat food thanks to the QuanTanium coating which requires only a drop of oil. Cooking food that otherwise sticks to the pan as eggs, fish or vegetables. Baked foods such as meat pies and casseroles. Creating a traditional taste exactly like our grandmothers did by cooking on the real stone. 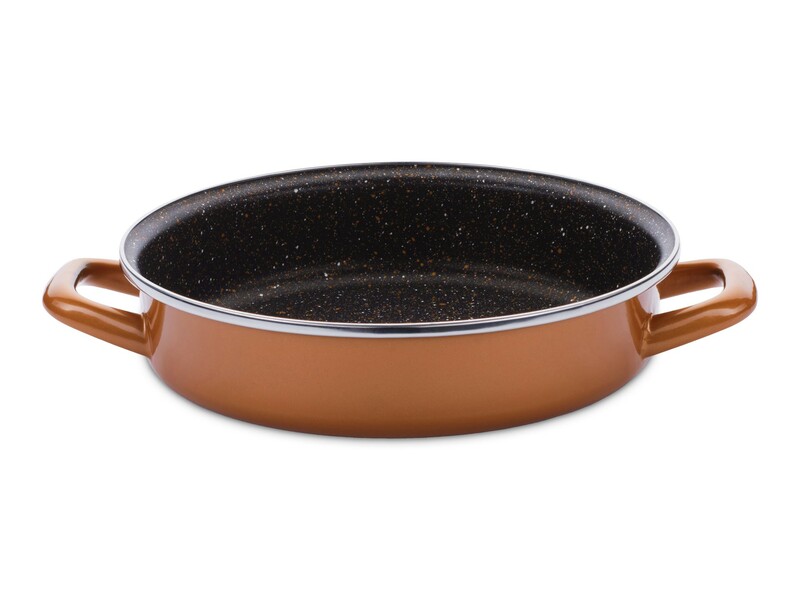 The secret of new CopperLux cookware lies in its QuanTanium coating, which is significantly thicker with its 5 sprayed layers. Apart from the titanium particles which strengthen the coating, we have also added real stone particles for extra abrasion resistance and healthier cooking and copper for better heat conductivity which allows you to spend less energy. 1. Why steel? Steel is strong and long-lasting metal. Pots and pans made of steel are heavier, thus providing a better balance. Steel has also good heat conductivity and is therefore very useful for longer cooking. 2. Why enamel? Protects the steel with a glassy layer, it is durable and resistant to most chemical attacks. Smalt also has a good heat conductivity and is naturally non-sticking material. 3. Why Whitford QuanTanium coating with copper and stone particles? For perfect non-stick & scratch-resistant properties, which enable non-fat cooking and make the cookware suitable for use with metal utensils. And even better heat conductivity – for faster cooking and less energy spent!